Oh la! Stunning reflection James.. there's still a lot of the Louvre I have to explore! The warm light and the straight shapes are great together. 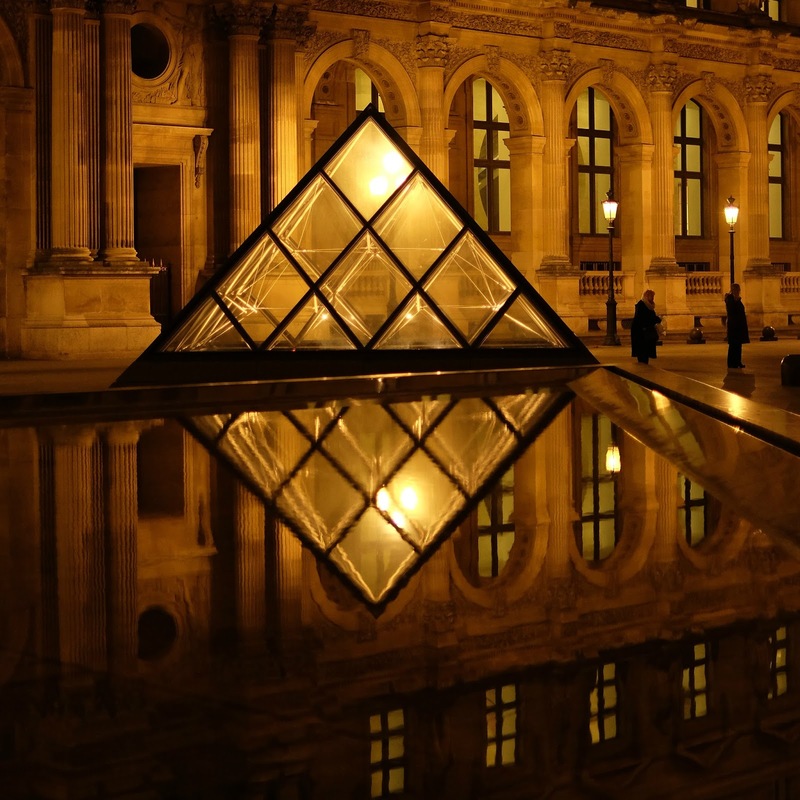 beautiful reflections...the Louvre should be moved to #1 on my to-do list! How did you know that a visit to Paris was just what I needed today??!! This is elegant! outstanding! You capture such wonderful and gorgeous pictures to share with us. A wonderful image of this wonderful building. Oh la la! Je l'adore, James. Awesome!!! Spectacular nightscene and magnificent reflection! Like usual, your eyes catch the most beautiful reflections. It sure looks like a splash of beautiful gold! Do you know the Chinese made a replica of this pyramid in Shen-Shen, China (one the mainland's side of Hong Kong)? They also made one of the Eiffel Tower (a small one)! Wonderful shot. The two mysterious silhouettes add just the right touch. James, for some reason I am unable to post to your Reflections site today. I can not get the linky tool to accept the thumbnail. Tried several times and got an error statement. What a beautiful reflection this is , like a fairytale! Thats a very catchy reflection with that golden glow. Well done again. Really nice patterns ! and colors of course !